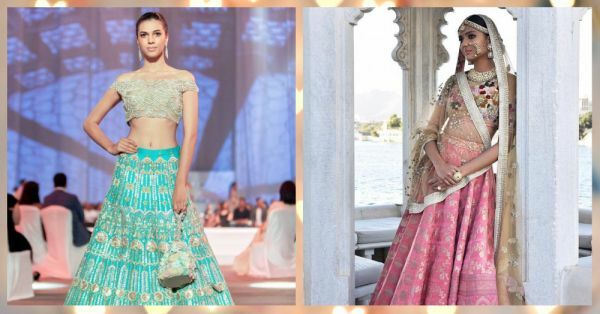 Here’s How Much Those Designer Lehengas *Really* Cost! Remember how Alia Bhatt was that typical bride-to-be in Humpty Sharma Ki Dulhania - ‘Main shaadi karungi, toh Kareena wala designer lehenga pehenke karungi.’ It’s natural for us girls to dream of wearing a Sabyasachi or a Manish Malhotra on our wedding. And without doubt, every bride does visit their stores to get an idea of the price points. So to make things easier and just so you have clarity, here’s bringing you all the deets on how much do these designer lehengas actually cost! Thank us later! Anita Dongre is known for her gota patti work and her choice of colours. Her lehengas are perfect for the mehendi, sangeet function as well as for the wedding. A great option for the minimalist bride and also for a day wedding. For an Anita Dongre bride, Rs 2.5 lakhs is a decent budget. Having said that, this is incase you’re looking for a printed lehenga with minimal work that can be accessorised with heavy jewellery. For the slightly more heavy pieces with intricate resham, dori or gota patti work, you’ll have to shell out anything from Rs 2.5 - Rs 4.5 lakhs. Do keep in mind that the latest collection or customized lehengas can go upto Rs 6 - 8 lakhs too. Sabyasachi, the one designer who is on almost every bride’s wish list. Afterall, nothing can ever look as royal as a Sabyasachi lehenga. His trademark sequins, the velvet touch and those dreamy colours. He’s the master of bridal couture and we can never seem to disagree. Sabyasachi bridal lehengas start nothing below Rs 3 lakhs. And that is just the beginning. A heavy, intricate piece or a latest design can easily go upto Rs 25 lakhs. Yup, that’s true! As far as customisation is concerned, while it’s a little hard to get done, it can set you back a few more lakhs than the original cost of the lehenga. Arguably bollywoods favorite designer, Manish Malhotra works magic with each of his pieces. And no doubt that he is a favorite with brides too. From his heavy traditional outfits to the recent, more modern collection, Manish Malhotra truly is every bride’s dream come true. The price of Manish Malhotra’s bridal collection is almost on the lines of Sabyasachi. The lehengas begin at around Rs 3 lakhs. And these are not necessarily bridal lehengas - though the minimalist bride can totally carry it off. Move to the more bridal, heavy lehengas and you could be spending anything from Rs 7 lakhs to even Rs 20 lakhs. Ever since Anju Modi dressed Deepika for Bajirao Mastani, she has set new standards for brides-to-be. And it won’t be wrong to say that Anju Modi is the name when it comes to royal wedding couture. Well, the good news is that designer Anju Modi’s collection comes in a wide price range. Unless you’re not looking for something that’s typically bridal, you can get your hands on a lehenga for around Rs 1.75 - Rs 2 lakhs. While the prices keep going higher based on the work, you can totally get a beautiful Anju Modi bridal lehenga for Rs 5 lakhs. For the offbeat bride who wants to experiment with colours and patterns on her big day, Varun Bahl is the go to name. And it’s safe to say that his floral collection is just what the summer bride needs to look like a million bucks. While the ace designer is a great option for your sangeet and engagement ceremonies, if you do want to go slightly different with your wedding lehenga, Varun Bahl will cost you anything between 3.5 - 4.5 lakhs.